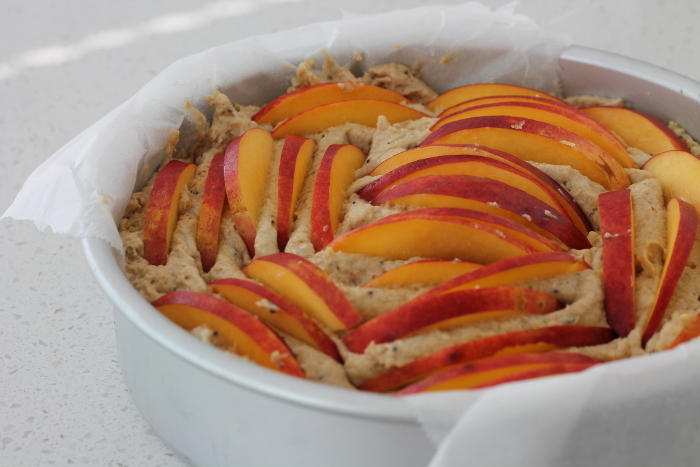 Enjoy the last few weeks of summer with this late-summer nectarine, yogurt and poppy seed cake made with local stone fruit. Summer ain’t over yet! (Sorry Calgary). The sun is still shining, the kids are still on an (extended) summer vacation, beaches are still packed and we can still enjoy patio season.All the while our Alberta neighbours are breaking out their snow shovels – in September – yikes. While for most of the summer I refused to turn on my oven to cook or even bake, I obliged to crank up the heat for this late-summer cake. You can use any stone fruit you like, such as peaches, apricots, plums or even cherries if you must. Late summer and early autumn fruit are some of my favourites – all the local apples are rolling into the farm markets are crazy low prices (hello 79 cent BC Gala Apples!). The first pie of the season is right around the corner – I can smell it. This cake is like a pound cake, it’s moist and not overly sweet with a good texture – made even better with the addition of poppy seeds and quinoa flour. Take a few pieces to the beach, a family picnic or an afternoon snack – great for an after dinner dessert topped with some dairy-free ice-cream. 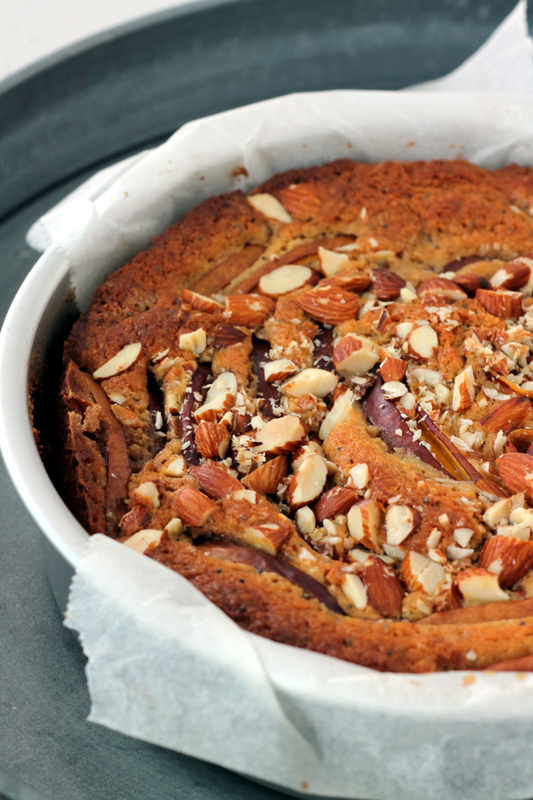 I like to think of this cake as a good snacking cake – something you would have for an afternoon tea. Maybe I’ve been watching too much Downton Abbey (binge watching at its finest), however, I would imagine this would be great for a luncheon, having tea with the ladies of Downton and the Dowager Countess. Netflix makes it far too easy to binge watch entire series (if only to catch up to the current one, after I apparently missed the first four-season craze). Have you binge-watched anything good lately? If you’re on your 3rd season of binge-watching, sit down with a nice cup of tea and a slice of this cake. 1. Preheat the oven to 350 degrees F. Line a 8″ round baking pan (or square) with parchment paper. Set aside. 2. Using a stand mixer, cream the butter, sugar, vanilla extract, and lemon zest on medium speed until light, about 3 minutes. Add the eggs one at a time. Mix until combined. Stop the mixer and scrape down the bowl. Add the yogurt and mix until combined. 3. In a medium bowl, whisk together the brown rice flour, quinoa flour, almond flour, poppy seeds, ginger and baking powder. Add the dry ingredients to the bowl of the mixer and mix on medium speed until it comes together into a creamy batter. 4. Scoop the batter into the greased pan and spread it evenly. Smooth out the top with a spatula as much as possible. 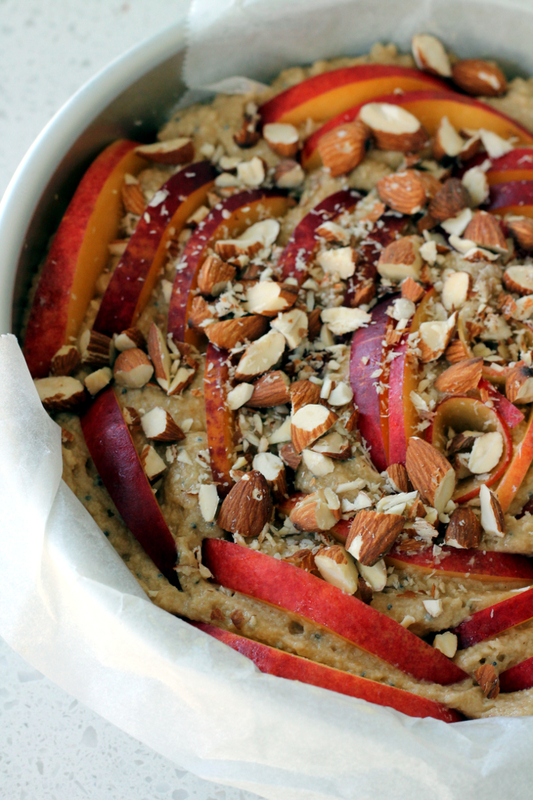 Top with sliced nectarines and sprinkle with slivered almonds. 5. Bake for 1 hour – check, and bake for an additional 10 minutes if needed, until a toothpick inserted in the centre comes out clean. Let the cake cool in the pan completely. Pick up the cake by parchment paper and transfer to cooling rack. Store at room temperature for a day or two, longer in the refrigerator (if you don’t eat it all in one day).